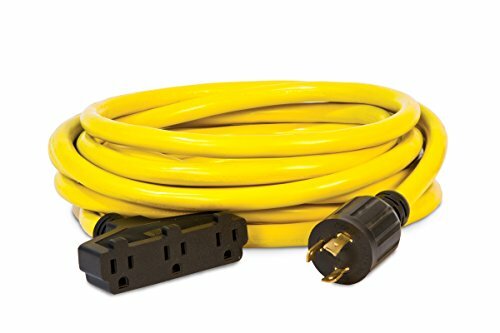 The Champion Power Equipment 48034 25 ft. 30A 125V Generator Power Cord is designed for quick, dependable, and convenient use of power where and how you need it. It will change your non-standard locking outlet into something acceptable for everyday use, powering items during an emergency or getting power to your tools in remote locations. The cord converts (1) 30A locking plug (L5-30P) to (3) 20A household outlets (5-15R). The high capacity 10 gauge wire is rated for use with 125V and generators up to 3750 watts. The cord features durable insulation rated for outdoor use and allows you to you run a generator from a safe distance keeping clear of noise and hazardous emissions. It is also heat and cold resistant to remain flexible in extreme temperatures. Champion has years of experience providing dependable and durable power equipment designed and engineered in the US for the North American and world markets. Champion products are the standard of performance excellence – for work, for play, for home. We make the power that makes your life easier. The Champion 48034 25 ft. 30A 125V Generator Power Cord comes with a 1 year limited warranty. Champion demands excellence from their dedicated technicians and service network ensuring that you will receive world-class service and response wherever and whenever you need it. Give us a call today or visit www.championpowerequipment.com to view our entire product assortment.